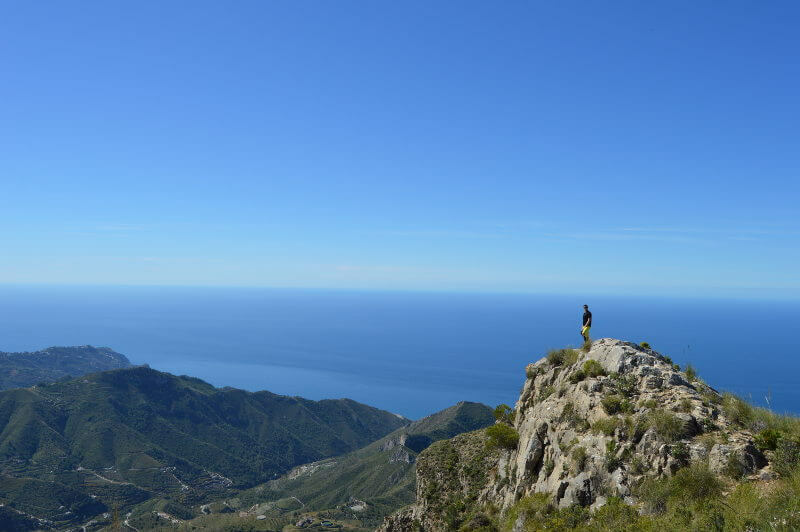 The Sierras de Tejeda, Almijara and Alhama Natural Park covers approximately 40,000 hectares of land and sits between the provinces of Granada and Malaga. It’s characterised by its rugged and arid landscapes. Bar a few river walks, including the Rio Chillar, Rio Verde and Río Cacin, the best times of year to hike in this area are Spring and Autumn. It gets seriously hot in the summer. Hot and very dry. Always bring lots of water. 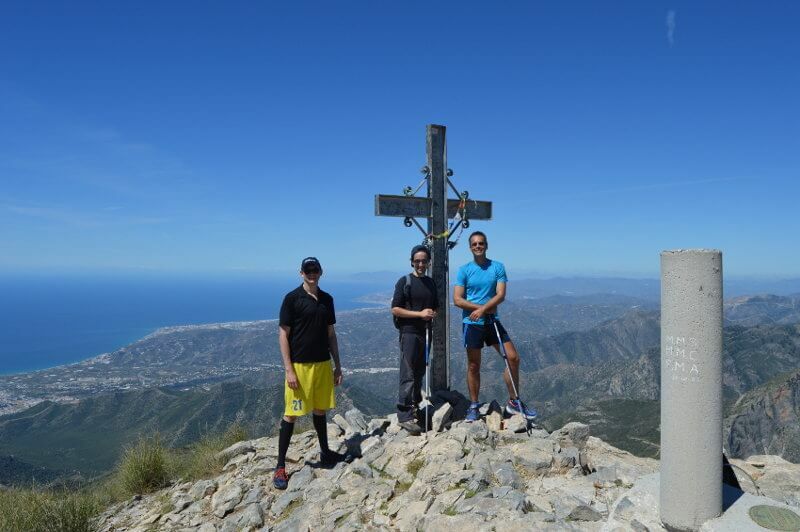 One of the most majestic and accessible peaks is El Cielo’s at 1508m. 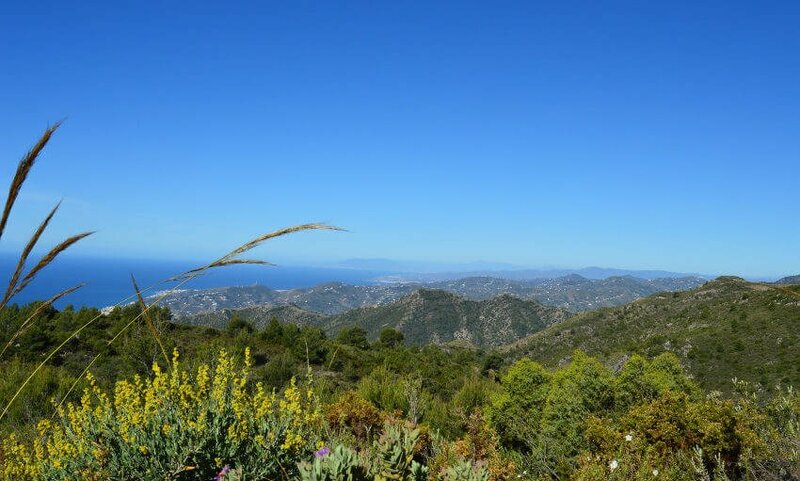 You’d be hard pressed to find better views on a clear day than those on offer from El Cielo’s summit. Here’s a photosphere from the top that I took on an earlier hike. Hiking up El Cielo is now popular. There are several ways to get up there. The route below is the most common and probably the easiest. The only variation we added onto it is on the way back down. Rather than the usual linear hike, straight up and back down the same way, this one is circular. One important point to bear in mind is the access. During the summer months, access to the natural park by car is restricted. You’d have to leave your car at the Nerja caves (Cuevas de Nerja) and start from there. This adds an extra 10kms onto the hike. Although not difficult, it’s flat forestry track, it does get a bit monotonous after a while. The track makes a good run, but a fairly boring walk. When driving into the park you have two options: you can park and leave your car at the first junction, which is a popular choice (I’ve marked this waypoint as ‘El Pinarillo junction’ on the track – see below), or you can take a left here and carry onto the Área recreativa El Pinarillo. We started and finished in the area recreativa. 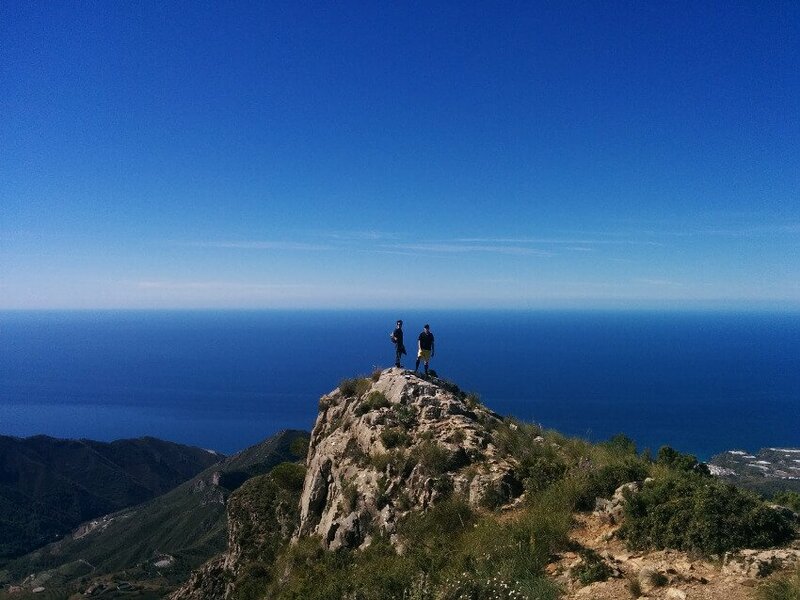 I was joined on this hike with Juan and Matt from our coworking space in Malaga. A fun morning out. The path is marked and very clear. The last two kilometres are steep. Very steep! And loose underfoot. Take it slowly. The peak is visible from the worst parts of the climb, just keep focused on getting there. From the summit, make your way down the same way you came. After approximately 500m you’ll veer rightwards. This track down is faster, although steeper. Poles are advisable. You’ll come out at the entrance to the Barranco de los Cazadores. 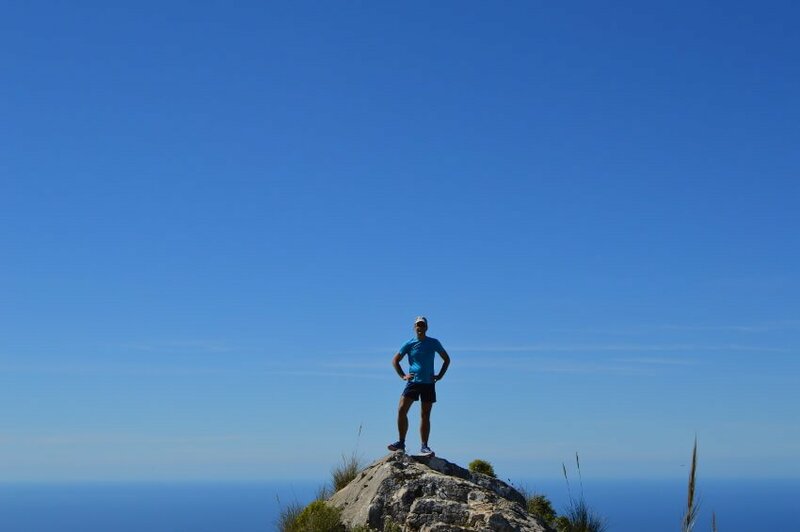 A truly beautiful spot and the place to start another great hike – up the Almendrón. Follow the river bed downwards and back towards civilisation. You’ll quickly arrive back at the forestry track in an area called the Barranco de la Coladilla. Take a right here, going towards the Fuente del Esparto – a natural spring. This water is drinkable. Well, we’ve been drinking it for years with no obvious problems…..
From here, you cross back over the dry river bed and you’ll fall back onto the Área recreativa El Pinarillo. Where we started the hike. 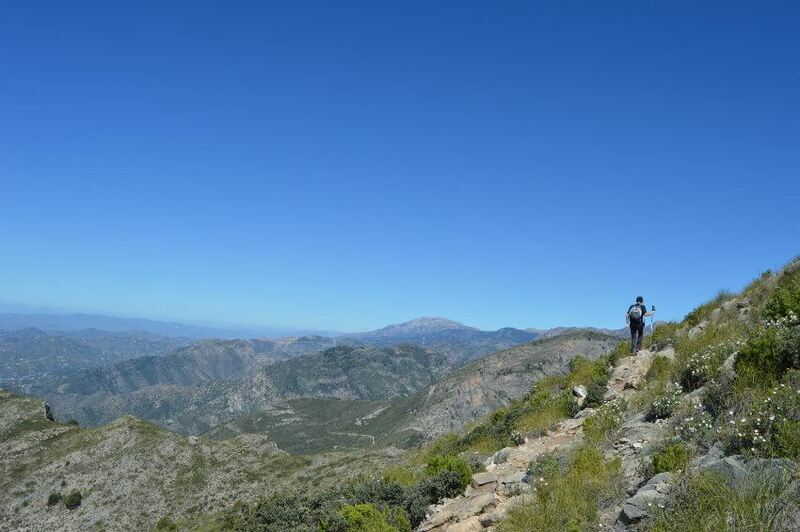 Related hikes – one of my favourite hikes in this area is the hike up the Alemendron via the Barranco de los Cazadores a really beautiful walk.